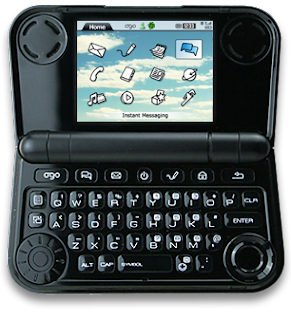 Ogo is a mobile device which allows you connect with contacts on your ICQ or MSN Instant Messenger lists. Ogo lets you IM your friends, family, colleagues and more with all the fun and features you're used to on your PC. Additionally you can add emoticons, alterticons, sounds and more. With Ogo, you can keep the conversation rolling while you're on the go. Ogo's finger friendly full-featured keyboard makes it fast, efficient and easy.